1. 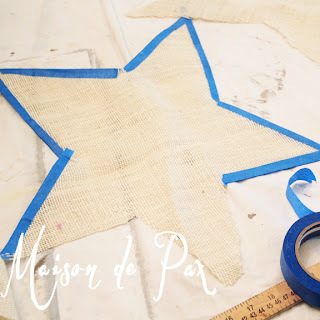 Cut two burlap stars (fold your fabric and cut two at once so you ensure they match), and set one aside (it will be the back, so it is not needed until the end). 2. Use painter’s tape to mark off an edge on your front star. 4. 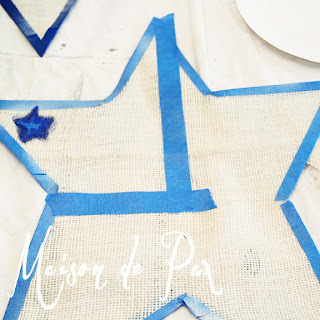 Draw multiple stars (I just free-handed because I wanted an imperfect look, but if you have a stencil, go for it!) on painters tape. 5. 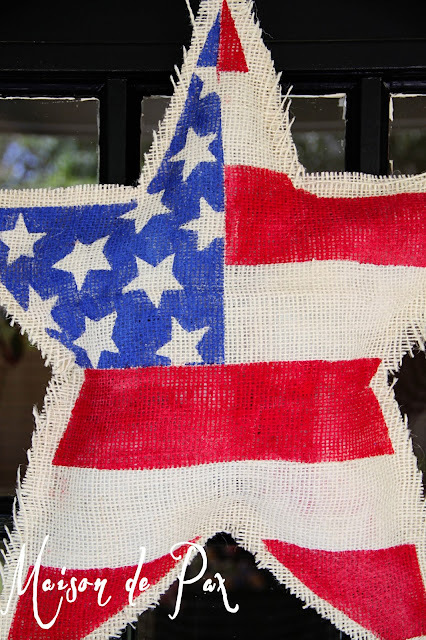 Check one star to make sure it works and then place your stars as you like. 6. 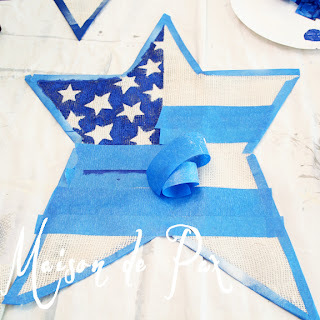 Paint your “stars” section blue and carefully remove your stars while the paint is still wet. Tip: Always try to remove painters tape while the paint is wet; it should give you a cleaner line. 7. 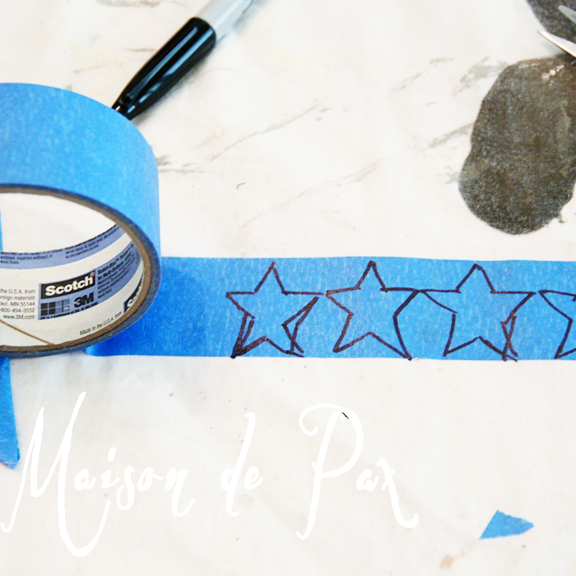 Tape off your “stripes.” Tip: Use painter’s tape (pressed down gently) as a space holder to even space your stripes. Peel it off before you paint, of course! 8. Paint your stripes red. 9. 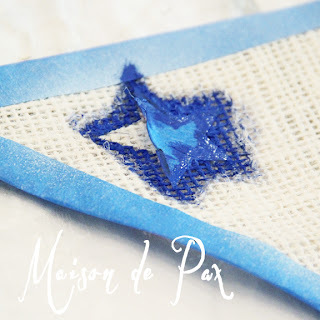 Remove all tape and let dry. 10. 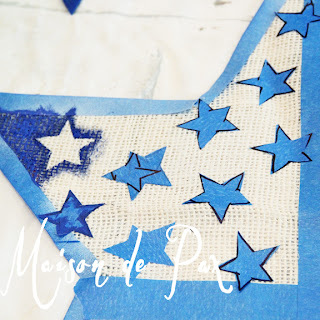 Place painted star face up on top of unpainted star (the one you set aside earlier) and run a bead of hot glue between the stars along all but one of the edges. Leave an opening!! Tip: Use a plastic knife or popsicle stick to press the two pieces of burlap together while gluing; burlap is a very loose weave, and that hot glue will burn you when it seeps through! 11. Roll/stuff plastic grocery sacks between the two pieces of burlap to attain your desired fluffiness. I wanted mine to be fairly flat, so I used just 5 or 6. 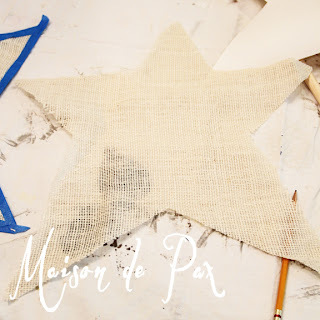 If you are making this for indoor use, then batting of some sort would certainly work, but since I wanted mine to hang outside, I chose plastic bags for durability (and price!). 14. (Optional) Spray with a protective sealant. If you live in the tropics, like me, then it seems like a good idea… I used a spray clear acrylic. 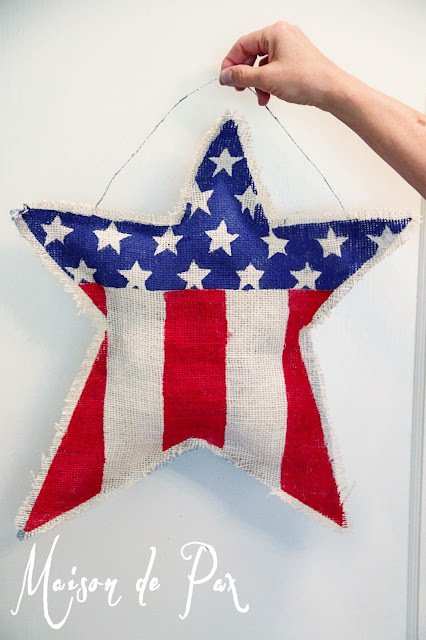 For hanging, you can use wire like she did (hooking it through the burlap behind and adding a dot of hot glue to secure) or you can use a hook. I grabbed a 3M one and just stuck it to our back door and hung the hook through the fabric. 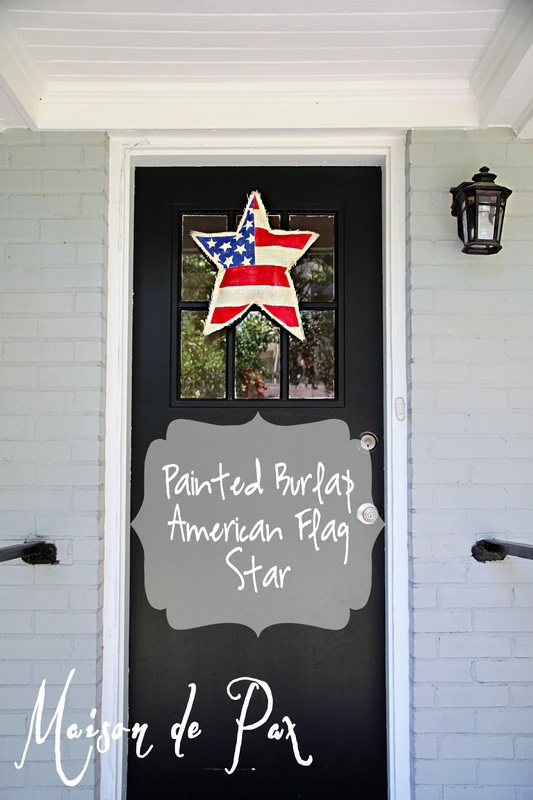 I opted to display it on the back door since we have a double front door that’s mostly glass… Too hard to figure out where and how to hang things there! 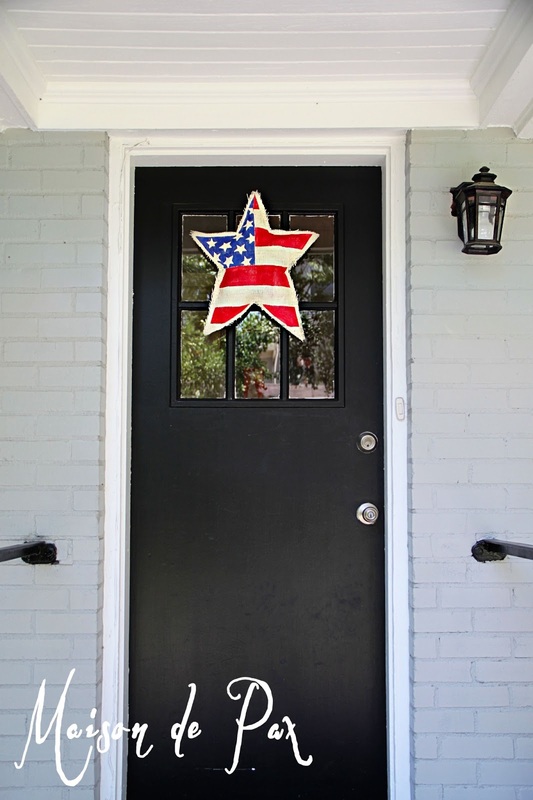 I rather like it against our simple back door, though. 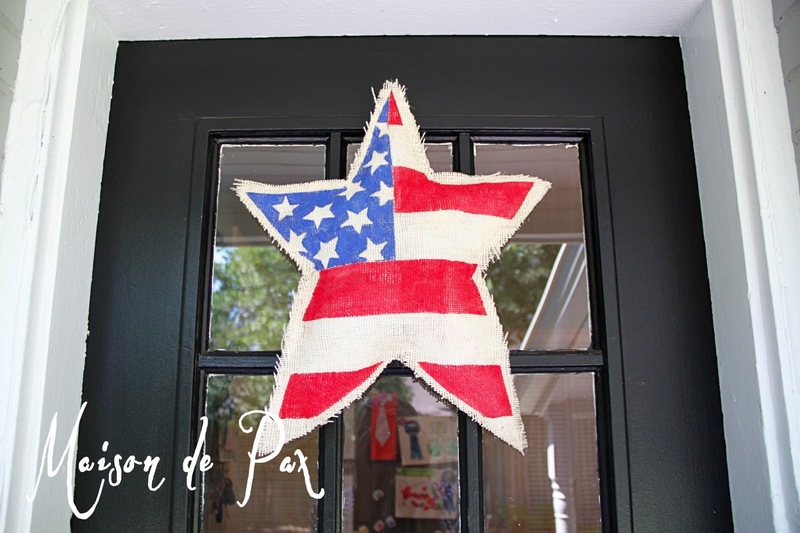 I think the texture of the burlap is a nice balance to the crisp lines of the black door and planked ceiling. Very interesting and well explained! I will be trying them. Thanks, Susie! 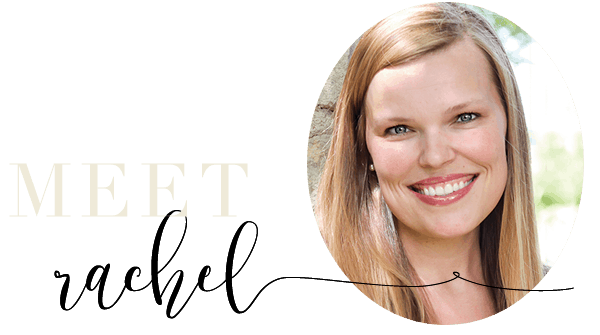 I am glad they inspired you!